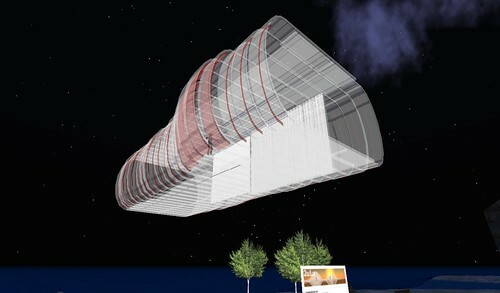 In physical reality, the architectural shell is a relatively static and motionless artifact. The occupant plays a passive role, observing but rarely impacting its composition. Winston Churchill’s statement, ‘We shape our buildings and afterwards, our buildings shape us,’ illustrates this point well. In a virtual environment, the architecture is capable of transcending the limitations of static buildings, and can become as fluid and dynamic as the communities of people it hopes to serve. The topic of this installation, ‘Reflexive Architecture’ is just one vector suggesting the emergence of a new language of virtual architecture, free from the habit of pure physical replication. 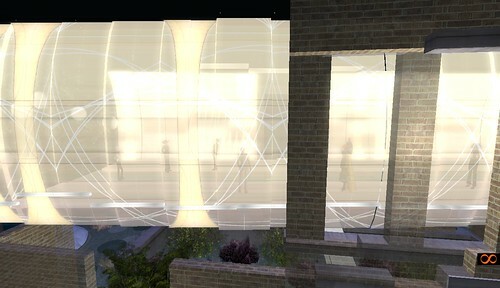 In this way, we can shape our virtual buildings, and afterwards we keep shaping them. There is a polarizing tension emerging between virtual architecture primarily focused on replicating elements of physical reality, in contrast with architecture that explores purely virtual concepts not possible in any other medium. In an environment where avatars are free to create anything they can imagine, the vast majority of the architectural fabric created is still largely driven by very literal parallels to the physical world. This happens for good reason, as we have learned to visually organize the world around us, real or virtual, based on familiar cues and patterns. 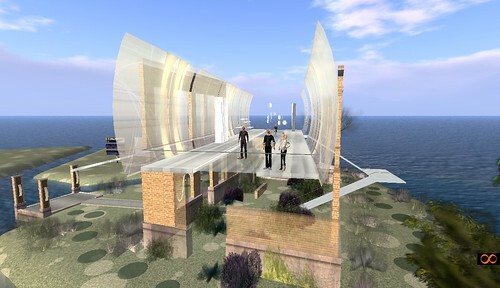 A roof may not need to protect us from the elements in virtual space, but it organizes a space. Even though you can fly, a ramp is still a strong wayfinding mechanism. In examining the differences between real and virtual environments, it becomes clear that physical architecture is relatively static and unchanging, whereas virtual architecture has the capacity to become far more dynamic; behaving more like a liquid than a static and passive artifact. I believe this seemingly simple distinction could serve as a core ingredient and driving force behind a new language of virtual architecture. In this way, the idea of reflexive architecture is not a new language of virtual design, but my hope is only to establish a simple diagram that I hope will inspire further progress and exploration of dynamic new forms of virtual architecture.